Not to be confused with Fremont Unified School District. Fremont Union High School District (commonly abbreviated FUHSD) is a school district in Northern California, serving Cupertino, most of Sunnyvale and parts of San Jose, Los Altos, Saratoga, and Santa Clara. As of the 2013-2014 school year, it serves 10,667 students. The district superintendent is Polly Bove as of August 22, 2006. Founded in 1923 as the West Side Union High School District, the district served the agricultural Fremont Township in the West Valley region, and still serves the regions covered by the former Township today. It originally had only one school (called the West Side Union High School), which operated in a few rooms of the Sunnyvale Grammar School building before relocating to the intersection of Fremont Avenue and Highway 9 (now Sunnyvale-Saratoga Road). Two years later, in 1925, the district was renamed as the "Fremont Union High School District" and its only school was renamed as "Fremont High School". With the rise of suburban growth which swallowed up the West Valley area in the 1950s and 60s, the district established five more high schools: Sunnyvale High School (1956), Cupertino High School (1958), Homestead High School (1962), Lynbrook High School (1965), and Monta Vista High School (1969). Due to declining enrollment, Sunnyvale High School was shut down in 1981, with its campus being leased to the King's Academy. Fremont is the oldest school in the district. Lynbrook and Monta Vista are the highest achieving schools based on testing scores. During the 2013-14 school year, there were 10,667 students in Fremont Union High School District. In terms of race and ethnicity, the district is predominantly Asian American. European American students make up a large minority. Hispanic and Latino students are also a sizable minority. In contrast, African American students are not very numerous. During the 2007 school year, Asian American students made up 53.3% of the school district's student population. European American students made up 32.7% of the student population; Hispanics and Latinos made up 11.7% of the population. African American and American Indian students made up 2.0% and 0.4% of the population respectively. Because the school district has recently faced a substantial budget deficit, it is now only enrolling residents who live within the district's boundaries. In the past, many students who did not live within the district were allowed to attend Fremont Union High School District's schools, but now the district is closely investigating all student residences. These investigations sometimes involve going into a student's alleged home, where a specially-trained district employee searches the home—including the student's bedroom—for signs that the student actually lives in the home. Video of two such inspections aired in a 2006 segment of the ABC News program 20/20,. The narrator, John Stossel, was showing how the excellent reputation of Fremont Union's schools motivates parents to lie about their child's actual home. As explained on the 20/20 program, if the student is found to be from an outside area, he or she may be expelled from school. Sometimes this policy has caused controversy among parents and teachers, but the district must maintain this policy in order to keep class sizes low. As of 2005, the district employed a total of 845 employees. The Board of Trustees, which sets the district's regulations and rules, has five members. At the Fremont Union High School District’s August 22, 2006 Board of Trustees meeting, on a 3-2 vote the Board terminated the contract of Superintendent Dr. Stephen R. Rowley. His contract would otherwise have expired June 30, 2008. The Board then asked Deputy Superintendent Polly Bove to serve as Acting Superintendent. Upon her acceptance, the Board unanimously approved her appointment. 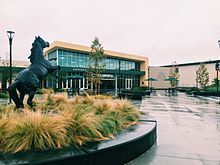 The Fremont Union High School District runs a fairly advanced technological system, including its own website servers, IP addresses, VoIP Infrastructure, and library catalog. SchoolLoop is the school district's primary means of communicating to students via the Internet. This page was last edited on 16 November 2018, at 05:46 (UTC).